It is an age-old and well-trusted remedy for many female uterine disorders. It strengthens the uterus and serves as one of the best uterine tonics. It is specific for leucorrhoea. Its main ingredients is betel nut (Chalia). 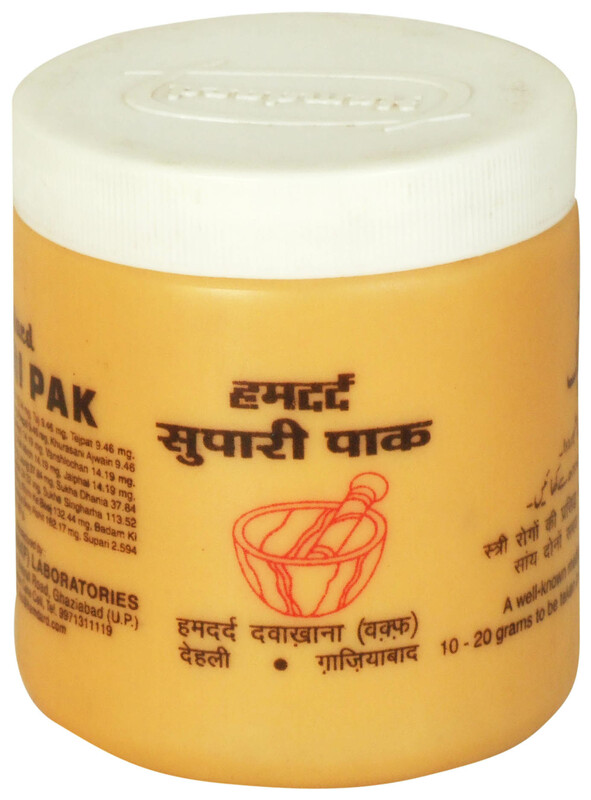 In repeated and threatened abortions due to the weakness of the uterus, Supari Pak is an ideal preparation to preserve pregnancy. It is specific for leucorrhoea, the common cause for female general illhealth and weakness. It also increases the appetite and strengthens the kidneys. Males can also use Supari Pak for spermatorrhoea, excessive noctural emissions and for retentive power. Each 10 g. contains: Kapoor 10.14 mg, Taj 9.46 mg. Tejpat 9.46 mg, Nagar Motha 9.46 mg, Sukha Pudina 9.46 mg, Peepal 9.46 mg, Khurasani Ajwain 9.46 mg, Javitri 14.19 mg, Shuait Chandan 14.19 mg, Kali Mirch 14.19 mg, Jaiphal 14.19 mg, Safaid Jeera 18.92 mg, Vinoleki Giri 37.84 mg, Laung 37.84 mg, Sukha Dhania 37.84 mg, Peeplamool 37.84 mg, Neelophar Kaphool 24.32 mg. Sukha Singharha 113.52 mg, Shatavar 113.52 mg, Nagkeshar 113.52 mg, Khirni Ka Beej 132.44 mg, Badam Ki Giri 162.17 mg, Pista Ki Giri 152.17 mg, Munaqqa Beej Rahit 162.17 mg, Supari 2.594 g. Chini 2.594 g. Madhu 2.594 g; Gao Ghrat 1.297 g.
A well-known medication for female disorders. 10-20 grams to be taken in the morning and evening with milk. hi before one & half month a delivered a child. can I consume hamdard supari pak.